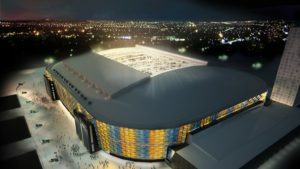 Speculations about where the swedish final would be held ended today as SVT announced that the final once again will be held in Friends Arena. Lidköping is the newcomer among the other hosting cities of the Melodifestivalen tour that starts in the ESC-arena in Malmö on the 1st of February and ends in Friends Arena on the 8th of March. Stockholm has hosted the final all the way back to 2002 while Göteborg and Malmö have both been hosts of Melodifestivalen heats several times. Linköping was a host city of a MF heat in 2005, 2008 and 2011, Örnsköldsvik hosted a heat 2007 and 2010 while Lidköping and Karlstad was a host in 2004 and 2006.